These chicken rolls are great for dinner and can be used to easily impress company. Ther are perfect paired with broccoli or asparagus. Each roll has only 4 Smart Points on the new Weight Watchers Freestyle program. 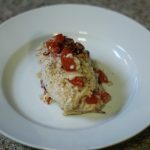 This Italian chicken roll is great over fettucini or rice. Preheat oven to 375 degrees and lightly coat a baking dish with cooking spray. Pound out the chicken breasts till thin enough to stuff and roll. Marinate the chicken breasts in the Italian dressing for 20 - 30 minutes. Combine the tomatoes, onion, Italian seasoning and cheese to make the stuffing. One the chicken is done marinating, remove any excess dressing and lay the chicken flat on a cutting board. Season the chicken with the salt, pepper, garlic powder. Spoon the stuffing mixture onto the chicken, then roll and secure with a toothpick. Roll the chicken rolls in the panko breadcrumbs and transfer to the prepared baking dish. Top each roll with any remaining bruschetta and then back for 25 - 30 minutes, or until cooked through.